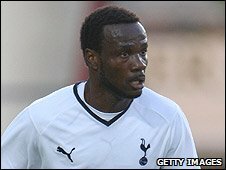 Blackburn have signed right-back Pascal Chimbonda from Tottenham after he passed a medical on Thursday. The deal for the 30-year-old France international is thought to have cost Rovers about £2m. It follows left-back Stephen Warnock's move from Blackburn to Aston Villa earlier on Thursday. "We've got an experienced player who is desperate to play football again, having missed it at Spurs," said boss Sam Allardyce. "The experience of the player, the adaptability of the player in a number of positions and his past record means we will have a good player on our hands and will not miss Warnock too much. "We all know his favourite position is right-back. We are well covered there, but he can play centre-back and left-back." Chimbonda has been signed in time to be eligible for Saturday's match against West Ham at Ewood Park. The former Wigan and Sunderland full-back made his name as a right-back but Allardyce has hinted that he could play him elsewhere in his backline. Having signed Lars Jacobsen and Michel Salgado this summer, Blackburn have plenty of cover on the right of defence but are light in the centre and on the left. Chris Samba and Gael Givet are the only two fit centre-backs as captain Ryan Nelsen is currently sidelined with a knee injury. Allardyce added: "It is the versatility I have chosen to go with rather than look for perhaps an out-and-out left-back. "Chimbonda has huge experience of Premier League football and he is eager and ready to get away from Tottenham because he has not played enough games for them and he just wants to play football." Chimbonda rejoined Tottenham in January after six months with Premier League rivals Sunderland. He began his career in England at Wigan after joining from French side Bastia.